Branding is very important, especially to big-name brands as Adventures in Odyssey. We had mentioned in the past that the original AIO novel omni-books were receiving a revised look, beginning with the third book in the series: Point of No Return (now available in its tweaked look). 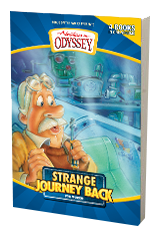 The three titles in the series were originally released in 2006 with the Adventures in Odyssey fans knew for years. 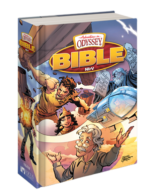 Now, in 2013, the first book in the omni-book series receives its tweaked design and features the current Adventures in Odyssey logo and updated title treatment. Odyssey collectors, be watching for your copy of the revised Strange Journey Back (Book 1). It’s next in line for a new look. Of course, you can visit our product page to learn more about this book and see the cover in high resolution. Mark Prescott is the new kid in town—and he doesn’t want to be there. His parents have split up, and the only one who wants to be his friend is an annoying girl. But not all’s bad. There’s an amazing ice cream shop called Whit’s End, and its owner is a quirky inventor named John Whittaker who seems to create fun and adventure for the whole town. As Mark gets drawn into life in Odyssey, the lessons he learns will change his life. Stay tuned, fans. The only other omni-book needing refreshed is Danger Lies Ahead (Book 2)! 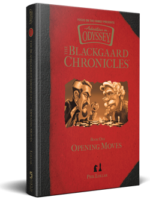 The Game Has Been Set with “The Blackgaard Chronicles,” a Brand-New Book Series!